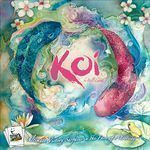 As a koi fish, you spend your days (turns) swimming to and fro by playing a number of movement cards, with the goal of gobbling up as many dragonflies and frogs as you can every day. Each movement card has from two to four programmed moves — straight, turn, rotate any direction and leap over a space — with some moves being mandatory when played and others being optional. Your tranquil koi pond begins with some decorative stone and a few lily pads, but you will also receive natural beauty cards in your hand that allow a player to add more lily pads, cherry blossoms, ornamental stone and frogs — which both enhances the beauty of the pond and causes turmoil beneath the still waters for the other koi. Lily pads are great as they spawn dragonflies every turn, each of which is worth 3 victory points when eaten. Cherry blossoms ripple the surface of the water as they land, causing all living things to scatter in the opposite direction — and if you play the blossoms wisely, right into your mouth! Stones prevent fish from entering a space and are best placed to block an opponent's path to a meal. Frogs are delicious 1 VP meals all their own, but they also eat dragonflies in adjacent spaces, so often they are placed to deprive opponents of their dinner. As the weather changes and a new event card is revealed for the day in KOI, so must your strategy change. At the end of seven days, the game comes to an end, with the best-fed fish being declared the winner. Be wise, be quick, or go hungry. Persevere and you shall succeed. Also features a solo play mode, where you must outscore a programmed AI opponent, with adjustable difficulty settings.